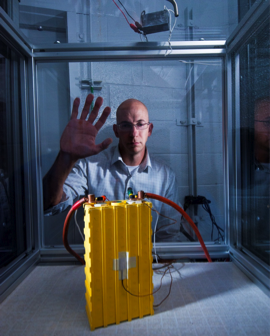 At the Battery Abuse Testing Laboratory (BATLab), a Sandia researcher prepares to test a battery pack to determine its response under abuse conditions. The Battery Abuse Testing Laboratory (BATLab) at Sandia is an internationally recognized leader in energy storage system safety research. The BATLab is committed to serving the energy storage community and the national interest with cutting-edge research programs, the highest quality testing results, and leadership in battery safety and reliability. For more than 13 years, the BATLab has supported the U.S. Department of Energy (DOE) Office of Vehicle Technologies programs, whose goal is to enable new electric vehicle (EV) technologies. The BATLab also continues to support other DOE, Department of Defense, NASA, and private industry customers. developing strategies to mitigate energy storage cell and system failures. In addition to core battery abuse testing capabilities, the BATLab is home to the world’s largest and most comprehensive battery calorimetry laboratory, the DOE’s largest lithium-ion cell prototyping facility, battery component analytical and diagnostic capabilities, and extensive failure-analysis and characterization tools. partner with national and international organizations to addresses the challenges of battery failure and potential safety issues.